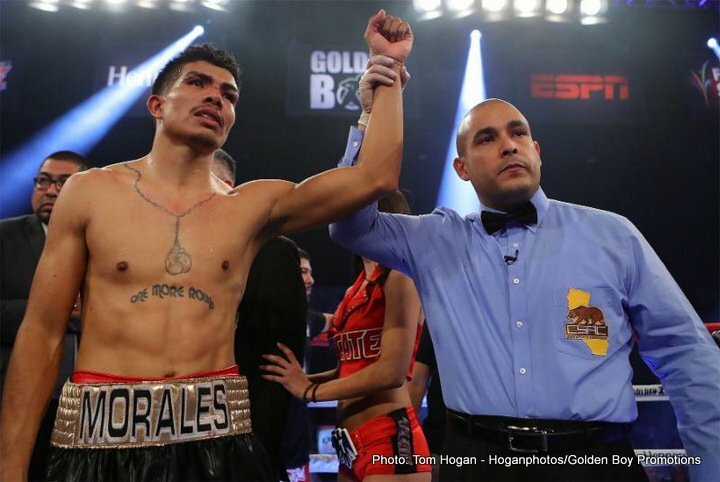 Carlos “The Solution” Morales (17-2-3, 6 KOs) scored a sixth-round technical unanimous decision victory against Dardan Zenunaj (14-4, 11 KOs) of Los Angeles, Calif. to win the vacant NABA Super Featherweight Title in the scheduled 10-round main event of Golden Boy Boxing on ESPN at Fantasy Springs Resort Casino in Indio, Calif. Morales, who also fights out of Los Angeles, suffered a bad cut above his right eye due to an accidental headbutt that forced the fight to be stopped at the third second of the sixth-round. Morales outboxed the rugged Zenunaj enough for all judges to score the fight 59-56 in his favor. In the co-main event, Raul “El Cugar” Curiel (2-0, 1 KO) of Tamaulipas, Mexico blasted Israel Villela (6-8, 2 KOs) via fourth-round knockout in a scheduled four-round welterweight fight. Curiel was too much for the much smaller native of Mexico City, Mexico. In the third round, Curiel scored a vicious knockdown that nearly stopped Villela then and there. Curiel, not wanting to miss out on scoring his first knockout, stopped Villela at 2:23 seconds of the following round. Marlen Esparza (4-0), the 2012 Olympic Bronze medalist of Houston, Texas, defeated Karla Valenzuela (3-17-3, 1 KO) via unanimous decision through six rounds of super flyweight action. Esparza was aggressive in every round, walking the native of Gomez Palacio, Mexico with a high guard before unleashing punishing shots to the body. Esparza looked for the knockout in the final round, but was unable to and won with three scores of 60-54. North Hollywood’s Ferdinand Kerobyan (7-0, 4 KOs) stopped Tavorus Teague (4-19-2, 3 KOs) of Paramount, Calif. in the fourth round of a scheduled four-round super welterweight fight. Kerobyan, a strong puncher with a stellar amateur background, used hard and quick combinations to stop Teague at 1:37 of the fourth round. Joet Gonzalez (18-0, 10 KOs), the 126-pound contender of Glendora, Calif. who is quickly rising to the top of the featherweight division, scored a dominant third-round knockout win against Isao Carranza (15-11-1, 8 KOs) of Mexico City, Mexico in a clash that was initially scheduled for eight rounds. After a feel-out first round, Gonzalez used a high-guard stance and power punches to the body and head to stop Carranza via hook to the body at 2:59 of the third round. Jonathan Navarro (12-0, 6 KOs), the rising super lightweight prospect of East Los Angeles, California, scored a unanimous decision victory against Nicaragua’s Nelson Lara (17-9-5, 9 KOs) over eight rounds of welterweight action. Navarro and Lara fought toe-to-toe in each round, but Navarro got the best of nearly all exchanges. In the opening bout of the night, San Antonio’s Joshua “The Professor” Franco (13-0, 6 KOs) defeated Carlos Maldonado (9-2, 7 KOs) of Los Angeles, California via eight-round unanimous decision. Franco intelligently outboxed Maldonado to win with three scores of 80-72. Coachella, Calif.’s Ryan Caballero (4-0, 2 KOs), the younger brother of former IBF Bantamweight World Champion Randy Caballero, scored a first-round knockout victory against Franco Gutierrez (1-1) of Agua Prieta, Mexico in a scheduled four-round featherweight fight. Morales vs. Zenunaj was a 10-round fight for the vacant NABA Super Featherweight Title presented by Golden Boy Promotion. The event wass sponsored by Tecate, “THE OFFICIAL BEER OF BOXING” and Hennessy, “Never Stop, Never Settle.” The fights took place at Fantasy Springs Resort Casino in Indio, Calif.